I’ve had this idea for quite a few years but haven’t put much time into it, between everything else I’ve been going on. 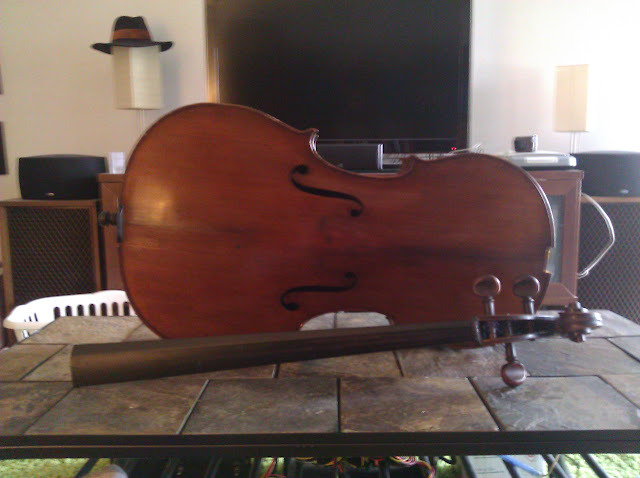 Once or twice a year for the past five or so years, I’ve posted on Craigslist seeking a broken cello to turn into an art project. Finally, the ad hit and I think I can make it happen. Verve//Remixed 3 has an incredible album cover. You should buy their music for that reason alone. I’m hoping to make my own version of the Cello Boombox on the cover…and this will be my starting point, a cello with a broken neck the owner wasn’t interested in repairing. The neck snapped off, the bridge is missing, and there are quite a few cracks (although they aren’t visible unless you look closely) and it needs to be re-glued. I doubt I’ll do anything with this until next year at least, but now it’s a possibility. I’m just glad I was able to find a broken cello, I wasn’t willing to destroy a functional instrument for this. Not to mention, a working cello costs a lot of money. Speaker size and placement. How many drivers will I use, and what types? Cabinet volume and phase cancelling. If I configure this as a stereo boombox, I’d need to isolate the enclosures internally from each other or the out-of-phase parts of the left and right channels of the audio could cancel or introduce distortion. Audio source. The Verve Remixed album cover is concept art, not a real product, so the knobs and panel meters and a floppy disk drive aren’t things I could realistically include. Do I mount a small music player in the center – maybe an iPod Touch, or a small Android tablet? Or should I just make this into an artistic speaker without its own audio source? Power. If this is going to have its own amplifier, how am I going to power it? An outboard power pack? Rechargeable batteries inside? If anyone has suggestions on those design topics, I’d love to hear them, or from anyone else who has attempted a project like this. This entry was posted in Commentary, Electronics, Ideas, Projects and tagged amplifier, android, boombox, cello, Cello Boombox, iPod Touch, Speakers, stereo, Verve//Remixed 3. Bookmark the permalink. The instrument on the cover of Verve is actually an upright bass, much more landscape to handle the speakers. The artist might not have that exact copy out, but I am certain he has 3 different models for sale. I have been making my own version of this. Strictly speaker boxes. Let me know what you think! Those are absolutely stunning. I haven’t finished my project yet – or really even started it, beyond picking out some interesting looking parts to put inside of it from Parts-Express – but it is still on my list. I’m planning to put some kind of an amplifier in the back of mine to make it into a self-contained cello boombox possibly powered by a car battery on an umbilical, but we’ll see. I hope you sell all of the ones in your Etsy shop. Do you have a favorite brand of tool you’ve used to cut the mounting holes that works well with the delicate wood used on the instruments?